We begin with William Brangham on the situationafter the storm. WILLIAM BRANGHAM: All across Eastern NorthCarolina, water has drowned out roads, more than1,500 of them. The flooding has steadily worsenedsince the storm made landfall near Wilmington earlyFriday. Over the weekend, this riverfront city home to 120,000 people was completely cut offby land. Today, North Carolina Governor Roy Cooper said crews managed to open a singlesupply route. But he warned evacuees against using it to return because the water keepsrising. GOV. ROY COOPER (D), North Carolina: We have got one limited route into Wilmington, and it's being used for supplies and necessary emergency material and utility workers and lawenforcement. And we don't need people going back right now, particularly when this route maydisappear tonight. WILLIAM BRANGHAM: Inside the city, people waiting in lines today for ice gas, food andother supplies. LOUIS BUCK, North Carolina: We were able to go and get groceries, so we have food, but wehave no power. So we have to be able to keep the food cold. And we have had to throw out alot of food, so we're trying to keep what we have left. LAWRENCE BROWN, North Carolina: Hoping I can get some gas. Then we're running out ofice at home. Been out of electric about four days now. WILLIAM BRANGHAM: Over two-thirds of the city's customers lost power and utilitycompanies are working to restore it. Jeff Brooks is with Duke Energy. He spoke to theNewsHour from Wilmington. JEFF BROOKS, Duke Energy Spokesman: Since storm, we have moved in additionalreinforcements into the area from as far away as Ohio and Kentucky and Indiana. And about1,100 of those line crews from the Midwest came down just as the storm was clearing the areaand have been working here on the ground ever since. We can't even get to assess thedamage in some areas. We're flying helicopters today to begin looking at some of the damagein the hardest-hit areas that we can't access by vehicle. WILLIAM BRANGHAM: Fifty miles to the north, Jacksonville, North Carolina, is also hard-hit. The New River burst its banks over the weekend. Jason Padilla paddled in a canoe throughwhat had been streets. JASON PADILLA, North Carolina: This has been, it's been surreal, man. You only see this inTV. I never thought I would see this for real. WILLIAM BRANGHAM: And it's expected to get even worse. Forecasts show heavy floodingcould reach 250 miles inland in North Carolina and with it tragedy. Today, 170 miles west ofthe coast, In New Salem, police found the body of a 1-year-old boy. The child was swept awayin floodwaters on Sunday when his mother lost her grip on him. EDDIE CATHEY, Union County Sheriff: They searched and searched and searched for thechild, and the child was found this morning. WILLIAM BRANGHAM: In another inland city, Fayetteville, 100 miles from the coast, thedowntown is largely underwater. 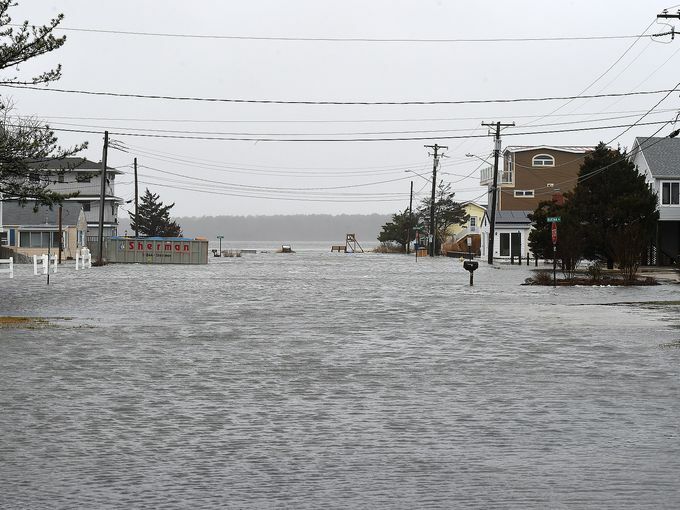 Officials have ordered new evacuations, worried the Cape FearRiver will go higher still. WOMAN: Basically, I just stacked up the chairs because I was thinking, maybe if we did flood, it would probably just come up to here, just to save a little bit of what I have. WILLIAM BRANGHAM: Wahida Reese and her daughter Anisa rode out the storm initially, but by Sunday, they were forced to pack up and leave. There could be environmental damageas well with word that several large hog waste lagoons in the North Carolina countryside havefailed and are spilling pollution. And a coal ash landfill owned by Duke Energy has also beenbreached. Meanwhile, officials in South Carolina are also warning of flash flooding after a longweekend of heavy rain from Florence. Similar warnings have gone out in West Virginia andVirginia, as the storm's remnants begin curving back to the north and to the east. For the PBSNewsHour, I'm William Brangham. JUDY WOODRUFF: This evening, authorities in Virginia reported one person killed in anapparent tornado spawned by Florence. We will take a closer look at another part of NorthCarolina's suffering in the wake of the storm. And that's later in the program.